Caterpillar built the first compactor in 1978. Since then, customers have played a significant role in fine-tuning the evolution of the design. Cat® Compactors are the ideal machine for soil, landfill, and paving compacting applications. 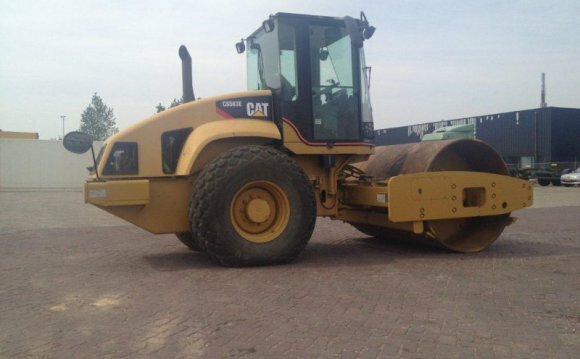 Cat compactors are durable, reliable, and engineered to handle all of your compaction needs. Cat Landfill Compactors are equipped with features like additional guarding and specific component placement to withstand harsh landfill conditions. The powerful steel structure absorbs heavy loads and delivers the Cat quality you expect. The spacious operator cab is designed to keep you working comfortably all day long. Cat Pneumatic Rollers bring significant fuel savings without compromising power and jobsite productivity. These Cat Pneumatic Rollers are extremely versatile and come in a wide range of models to match your soil or asphalt paving needs. Cat Pneumatic Rollers feature easy-to-fill ballast tanks, modular steel ballast configurations and an assortment of tire options. The pivoting operator station provides superior comfort and control. Excellent visibility enables easy maneuvering around any jobsite. Four-wheel drive Cat Soil Compactors are built to maximize soil density. The heavy-duty axles and transmission enable Cat Soil Compactors to handle tough jobs. The hinged hydraulic oil cooler and the 500-hour oil change interval reduce maintenance costs and maximize uptime. For additional productivity, a fast fuel adaptor can be added to your Cat Soil Compactor to reduce downtime during peak periods. Cat Tandem Vibratory Rollers set the industry standard for productivity and reliability. These Cat machines deliver efficient compaction performance and offer world-class features. Different vibratory systems are available to match your application needs. Various drum widths will help work efficiently on narrow shoulders, patching projects, a parking lot, or bicycle paths. The high frequency of the vibratory system allows you to get more soil density in less time. The comfortable, user-friendly operator station promotes a productive operating environment. Vibratory Soil Compactors provide the greatest productivity and reliability when compacting semi-cohesive and granular materials. Padfoot Drum Compactors can be equipped with specific pads to provide deeper lift penetration. Models equipped with the Cat pod-style vibratory system are virtually maintenance free. The cab is specifically designed to reduce operator fatigue and provide a comfortable operating environment to maximize productivity.